Today, I wanted to share some of my favorite, store-bought, brand-name food products we have discovered since we moved to Scotland. I am open to trying store brands, and trying cheaper options, but when you find a really good brand, it is hard to go back. Tikka Masala is "a rich and mild curry with fresh cream, natural yoghurt, juicy tomatoes and a touch of honey." This tomato-based curry has incredibly deep, rich flavor. We normally just add chicken and serve over rice, with Naan on the side. I love Indian food, and they have good Indian food here. But we do not have the budget for eating our, or even carry out, to get the good stuff. So, we decided to find a good way to enjoy it at home. We tried several different brands of Tikka Masala and this was clearly the best. And I stocked up on the sauce while it was on sale for £1 a jar, so it was good and cost effective. 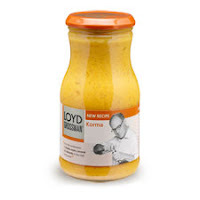 Korma is "a mild curry sauce with a rich blend of double cream, coconut and almonds." It is a rich curry, with just a hint of sweetness from the coconut. Again, we just add chicken and serve with rice and Naan. 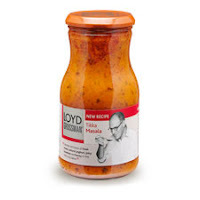 Having thoroughly enjoyed Loyd Grossman's Tikka Masala, we decided to try some of the other Indian sauces in this brand. We tried several that we did not like (in this brand or any other), but this was a great addition to our pantry. I love having good sauces in the pantry as a quick, but still yummy, meal when I'm too tired or busy to cook. And they are great for the nights when my hubby has to make dinner (which, lately, has been more often than I think he would like). 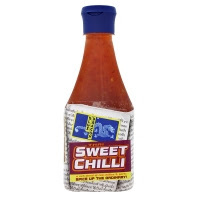 "Sweet Chilli Dipping Sauce is a spicy, rich blend of red chillies and garlic." This sauce is great for dipping spring rolls, but I really love using it to spice up stir fry and noodle dishes. I first tried this in a recipe found in a store magazine. It was a stir fry that called for sweet chilli sauce and hoison as the base. We loved the flavor and have been using in all our Asian cooking since. It is a little spicy when used by itself, but a few tablespoons in a mix adds great flavor and not much spice. "This oatmeal is milled to a medium grade, stone-ground from premium Scottish oats." The texture is technically the same as steal-cut oats, just ground by stone instead of cut by steal. Here in Scotland, they tend to like porridge more than oatmeal. These stone-ground oats still give you a creamy porridge, but have the richer texture and thicker 'bite' of the oatmeal I grew up eating. The kids love Scottish oatmeal and would eat it everyday if I let them (it just takes a little longer to cook than standard, rolled oats). 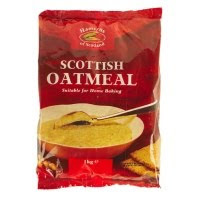 But the real reason I love Scottish Oatmeal is ... baking! These are the best oats for baking. They still give that wonderful taste that I love about oatmeal cooking and breads, but the texture is smoother and less chewy... and the kids will eat it. Try the Oatmeal Banana Bread recipe I'm posting on Saturday. "The delicate aromas of lemongrass and galangal combine with the fresh, zingy flavor of lime leaf and creamy coconut milk for a fragrant curry sauce." This curry is a mild by Thai standards, but does have a little spice. It is great with beef (although we also enjoy it with chicken), and green beans or courgettes (zucchini). 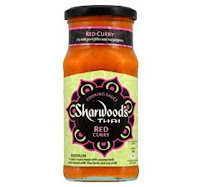 Sharwoods also makes a really good Thai Yellow Curry. Thing I Love Thursday is being hosted by Mama Mia this week while Jill from Diaper Diaries is in the Dominican Republic with World Vision. Those sound yummy! Our family is not big on curry; I should probably give it a try! I know... they do have good Indian food here. I do love that Blue Dragon! Thanks for doing the Indian- I always forget it when you tell me. walker's shortbread - my fave!